I'm feeling a little under the weather today (I had minor surgery a few days ago and am not quite 100% yet), and I didn't feel like working in my studio, so I decided to iron a yukata or two and organize a drawer I use for kimono storage. I'm very lucky to have built-in storage for my collection! So I have some pictures of where I store and how. The house I live in has an addition built by a slightly (the neighbors say very) eccentric man and he built 11 drawers for the upstairs "master suite" instead of a closet. 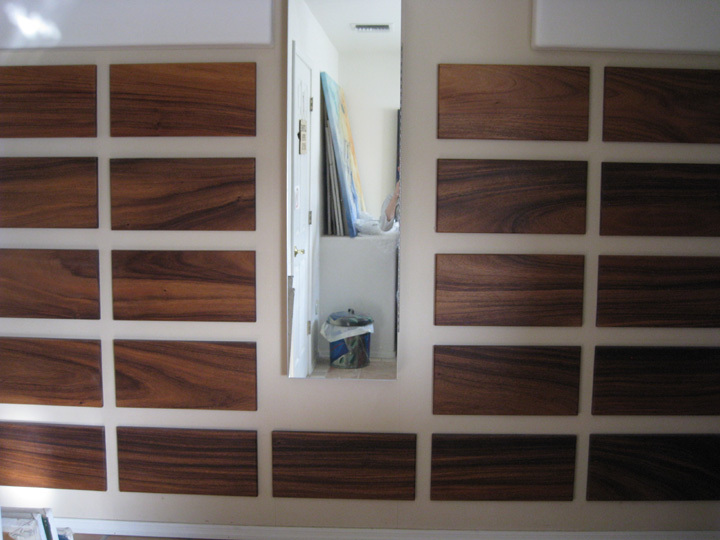 The drawers are faced with beautiful matched-grain mesquite wood, so they look really nice. The top drawers are so high, you need a step ladder to see what's in them, so maybe he was 7' tall and had a huge sock collection. We never met the mystery builder. 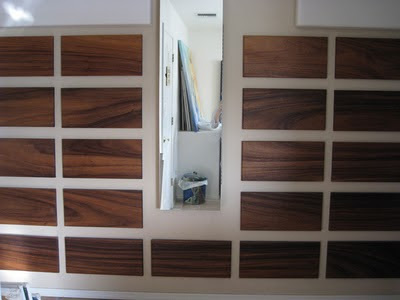 In the center of the drawers is a wall-mounted ironing board and mirror, which I love. We store blankets and bedding in most of the drawers but I have taken over half of the drawers and filled them with kimono stuff. It's basically a giant tansu. The drawers are a bit smaller than the typical tantoshi (kimono and obi storage paper packets), so I use white or unbleached glassine paper between kimono and obi for storage. You can get it at most art stores for about 50 cents for a large 22x30" sheet. It's acid-free and provides a barrier against dye transfer and moisture. You can even create "envelopes" by folding the paper and using acid-free tape (On the outside please!) to make smaller storage packets for obi, obiage, obijime, etc. More on making your own packets in a future posting. My kimono sensei said it's very important to store vintage Japanese textiles with paper between, not in plastic bags. She has seen vintage silk kimono disintegrate after being stored for years in plastic bags in boxes. Silk and wool need to breathe. 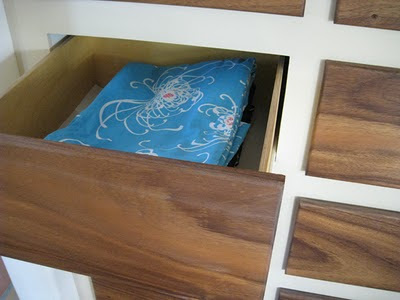 You can store kimono in those big rectangular plastic under-bed bins too, but make sure you use the glassine paper between each kimono and obi. She also recommended storing silk with silk and synthetic materials separately or with cotton. Wool kimono can go with other wool or with silk. Linen goes with cotton. You want to make sure you don't stack or pack things so tight that no air circulates yet protect from moths (cedar blocks and spheres work fine) and keep colors from rubbing off or transferring. Items should be as clean as possible before storing, so make sure you hang up all kitsuke items 24-48 hours to let perspiration dry and some wrinkles hang out before folding and storing: kimono, obi, all accessories, koshihimo, etc. I like to hang mine on special kimono hangers but a long, smooth wooden dowel would work too. I wash soiled yukata and synthetic kimono, using Zout on stains (Zout took out a giant butter stain on a yukata from corn-on-the-cob without hurting the fabric or the color!) and washing them in a mesh bag and on the "hand wash" setting. Then dry on the clotheline, press, fold, and store. Never, ever hang kimono or haori for storage! Always fold. The weight of the fabric on a western-style coat hanger will distort the nice vertical lines of the dress and ruin the shape of the shoulder and sleeves. 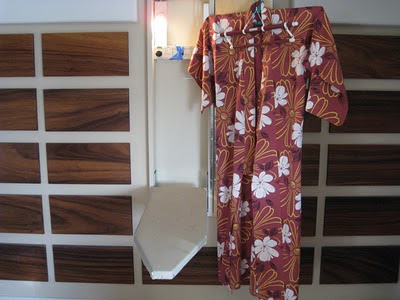 The ironing board is at the average ironing-board height and the yukata is about 61", so you can see how high up the drawers are. I just moved all (6) the yukata to this drawer today since I was running out of room, so now I need a few more sheets of paper to put between. The new purple hail kimono, which arrived today, went into the "synthetic kimono drawer". The drawers are great...when I first moved in to the house, they seemed odd, but now I love them. 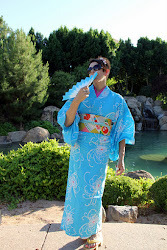 And I just ordered a garment steamer for another project...it should also be perfect for kimono!